Signed photo of Imre Varadi the Leeds United footballer. Home » Signed pictures » Signed photo of Imre Varadi the Leeds United footballer. Imre Varadi. This is a really nice 8 x 10 full length colour action photo of Imre Varadi the former Leeds United footballer. This photo is hand signed in black ink by Vardai. 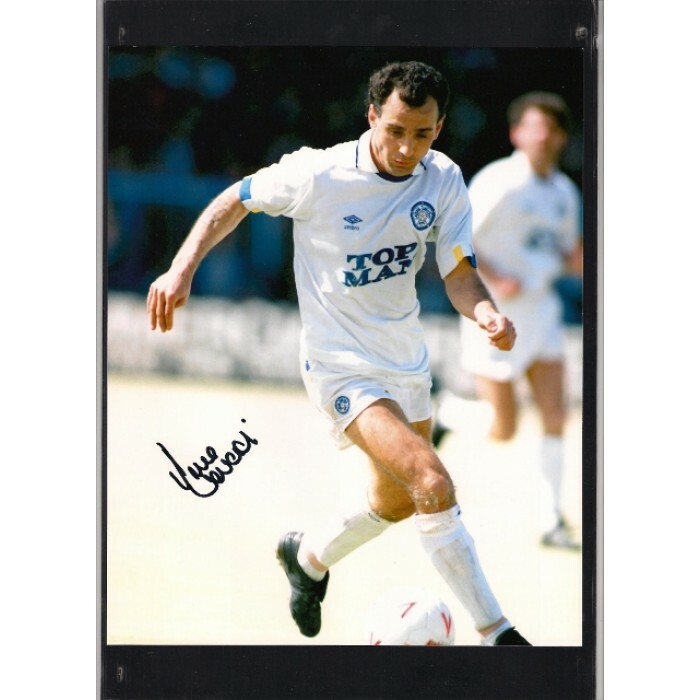 Imre Varadi played 26 league games for Leeds United between 1990 and 1993, scoring 5 goals. Varadi started out in non-league football with Letchworth before joining Sheffield United in 1978, shortly before his nineteenth birthday. Varadi went on to become a nomadic journeyman, who rarely spent more than two years with any club and never made 100 league appearances in the colours of any team he played for. From Sheffield United, he moved on to Everton, Newcastle United, Sheffield Wednesday, West Bromwich Albion, Manchester City, Swansea Town, Sheffield Wednesday again, Leeds United, Luton Town, Oxford United, Rotherham United, Mansfield Town, Boston United, Scunthorpe United £5.00.